As a minimalist and fan of the angular and the extreme in fragrances, I can appreciate, on an aesthetic level, the amazingly blended and balanced Diorama by Edmond Roudnitska, but because of its fruitiness, its spiciness, its powderiness — its too muchness — I cannot love it. Diorama is spicy, slightly sweet and fruity, musky and sharp.It's been described as a perfect fruit chypre, a cross between Roudnitska's Femme (in its Prunol buttery plumminess) and Mitsouko. 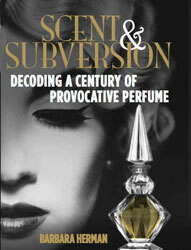 "No perfume has ever had more complex form and formula, more feminine contours, more sensual, more carnal. It seduces us with its spicy notes: pepper, clove, cinnamon, nutmeg, cumin, the scent of skin. It is disturbing with its animalic notes: castoreum, civet, musk. All the accords and themes to follow are contained in this perfume: the wood and the violet, the plum and the peach, the jasmine and the spices." Ellena says that from an olfactory point of view, Diorama is "well balanced." From the point of view of personality, of what Diorama suggests about its wearer, "well balanced" comes across as conservative compromise, like a Southern debutante in a black leather jacket. Hi again B. I am totally with you on this one. It actually makes me feel a bit ill, which was a huge disappointment as I had heard/read such wonderful things about it, including the Ellena description, and forked out a small fortune on a very old bottle of the parfum. I like the idea of it, I love the name - my favourite of the Dioresques* - and I like all of the old ads for it, so I just wear it in my head. *I would like to intellectually copyright that. NB Dior, I am open to offers. I love the name of this too, as well as the oddball Diorama accoutrements that surface on ebay before you narrow it down. I must say that it grossed me out when I first got my decant of the parfum, but now I DO love it, more than its cousin Femme. It's the darkness that really pulls me in, as I detest most "fruit" Femme rather supports its fruit whereas Diorama really tramples it underfoot. Perhaps that's the nauseating element, almost rotting fruit (which frankly, I prefer! It's certainly an acquired taste for Perfumistas only. No wonder they completely neutered the reformulation! hmmmm, given my Jones for Mollie Parnis, sounds as if this should be my next Dior purchase—having just scored some vintage Miss Dior.